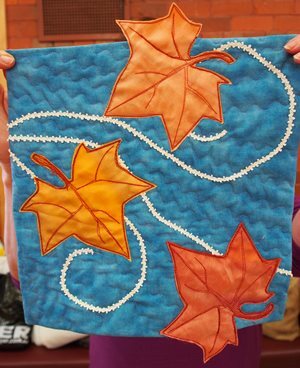 We have Glenys Mann as this years speaker, Owner/Coordinator of Fibre Arts Australia . She is an inspiring speaker with a huge knowledge of textiles and techniques. Please think about taking part in our challenge.The theme is - Tribal/ethnic/indigenous. Requirements area panel 12” X 16”. The judging will be by Viewer’s Choice, I hope all members are inspired, the textiles around for this theme are mouth –watering, I could enthuse for hours. Do remember to label your quilt on the reverse. Fran Batrouney has made a gorgeous tribal themed quilt, valued at $3,000.00. Raffle proceeds will go to the Servants Community Housing, so please collect your book of tickets and sell, sell, sell! Bring your Cup, Lunch, Stitching, Show & Tell, and your sense of Fun… A cushion might be a very good idea too. We are also calling for contributions for morning and afternoon tea. There is ample parking around the building, and we will help with carpooling for those who need a lift (and those who can offer one).